MISSOURI'S PREMIER DIGITAL AND PRINT PET MAGAZINE! TAME is an awesome website AND fun, trendy, regional publications. And, it's free! 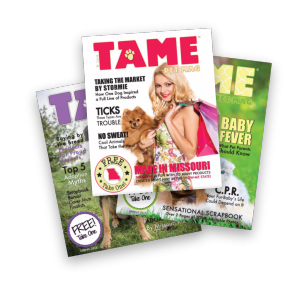 TAME is released quarterly, distributed all over St. Louis and in the Southwest Missouri area. Each year, close to 100,000 copies arrive on shelves pet stores, groomers, daycare and boarding facilities, veterinary clinics, and rescues to places pet parents also frequent, like restaurants, coffee shops, retails shops, events and more. TAME appeals to a very targeted audience. Readers and followers are the most involved and loving of pet parents. They treat pets like family and see that they receive the best food, vet care, grooming, training and entertainment. TAME is actively involved in the community. Print publications are regionally specific and staff can be found volunteering, attending, promoting and sponsoring animal related events every year. In addition, we advocate adoption and spaying and neutering. Would you like to have your business represented in the pages of TAME or online? We can help you reach your customers and clients in a fun, interesting way. Want to run your own TAME Pet Magazine? You can! In 2018, TAME is offering the opportunity for YOU to bring this dynamic magazine to your region. Find out how you can work with the best businesses, rescues, and organizations, all while making a difference in your community.